Your smile is more than just a full set of teeth, but when you lose one or more of them, it can affect every part of your oral health. Therefore, when you replace them, the goal should be as much to preserve all of your oral structures as well as immediately rebuild your smile. While modern prostheses like dental bridges and dentures can achieve much of that goal, only dental implants address the loss of your teeth roots. By upgrading your dental prosthesis with one or more dental implants, you can give your smile and oral structures a better chance at remaining strong and healthy for life. Choosing the right dental prosthesis depends on how many teeth you’ve lost and where they are along your dental ridges. 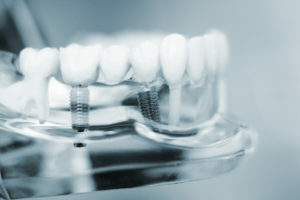 For instance, if you’ve lost one tooth, or multiple teeth that are adjacent to each other, then a dental bridge can be made to close the gap in your smile with one or more lifelike replacements. Missing teeth that aren’t adjacent to each other might need a partial denture, while a complete denture consists of an entire row of replacement teeth. Regardless of how many teeth you’ve lost, however, your dentist might suggest supporting your prosthetic with root-like dental implant posts for optimal results. The visible portions of your teeth, called the crowns, serve several purposes in addition to filling out your smile. A full set of teeth also helps keep your bite balanced, allowing your jaw to evenly distribute its pressure so that one or more teeth aren’t placed under too much pressure. Likewise, the roots of your teeth serve several purposes beyond supporting their crowns, such as stimulating your jawbone to promote a healthy flow of essential nutrients. Losing a tooth root, or multiple roots, leads to fewer nutrients being sent to your jawbone, which causes it to lose density and increases your risk of losing more teeth. In addition to filling out your smile, an implant-supported prosthesis also restores this stimulation and a full flow of nutrients, improving the long-term health and integrity of your jawbone and smile. If you currently rely on a dental bridge, partial, or full denture, then find out if you should upgrade with an appropriate number of dental implants. To learn more, schedule a consultation by calling Wager Evans Dental in Reno, NV, today at (775) 829-7700. We also proudly serve patients who live in South Meadows, Double Diamond, Caughlin Ranch, Donner Springs, Meadowood, Sommersett, Arrow Creek, and all surrounding communities.